Grandmaster Sahaj Grover provided the silver lining on a sluggish day for the Indian boys as he held top seed Yu Yangyi to a draw in the ninth round of the World Junior Chess Championship here in the ninth round. Kocaeli: With the championship approaching its business end, the Indian boys were in for a rude shock as only Debashish Das could score a full point. Despite a good result, Grover slipped to joint fourth with 6.5 points. 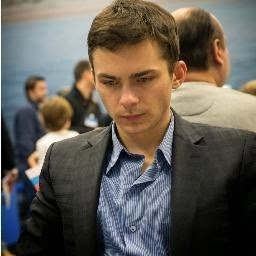 Alexander Ipatov (photo) made the most of his chances against Indian GM Vidit Gujrathi and shot into sole lead on eight points out of a possible nine. 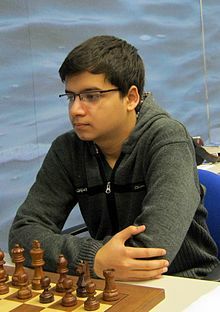 For the records, this was Ipatov’s fifth victory against an Indian in the championship in as many matches. For the first time in the event, Yu Yangyi slumped to second on 7.5 points while Jorge Cori of Peru elevated himself to third position on seven points. With four rounds to come, Grover shares the fourth spot with Samvel Ter-Sahakyan of Armenia, Duda Jan-Krzysztof of Poland and Aleksander Indjic of Serbia, who all have 6.5 points apiece. Among Indian boys, S.P. 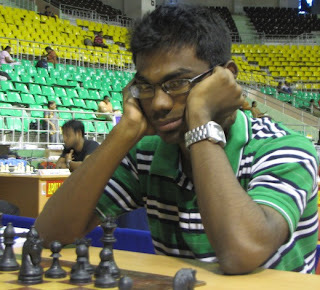 Sethuraman was held to a draw by compatriot N. Srinath in a keenly-contested game wherein the former could not make much use of an extra pawn for a long time as Srinath hung in to force a liquidation into a level queen and pawns endgame. Das defeated lower-rated Jinshi Bai to move to six points, a position he shares with Srinath, Gujrathi and Sethuraman. Grover did not get many chances out of a Nimzo Indian against Yangyi, who came with a new idea, forcing the Indian to spend a lot of time in the opening. 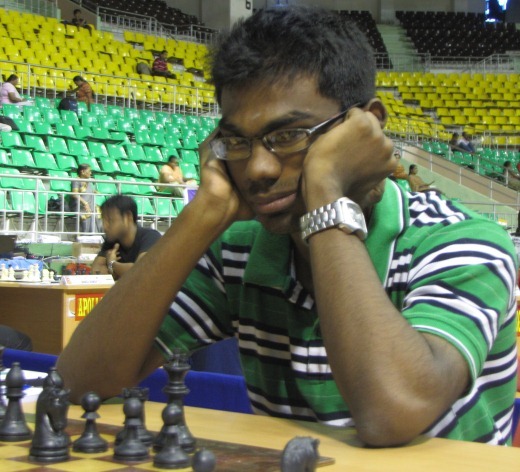 Kocaeli, Turkey: Indian Grandmaster SP Sethuraman crashed through the defenses of Russian Andrey Stukopin to score an impressive win and join Yu Yangyi of China in lead on 4.5 points after the end of the fifth round of World Junior Chess Championship. Playing the black side of a Sicilian Najdorf, Sethuraman capitalized on his chances in the middle game and launched a direct attack on the king that resulted in his winning a piece for a couple of pawns. Stukopin hung in there trying to find some counter play but the Indian came up with a startling manoeuvre to force checkmate after a knight sacrifice. It turned out to be a good day for Indian boys as GM Sahaj Grover outplayed Muhammad Luthfi Ali of Indonesia to jump to joint third spot on four points. Grover was at his technical best in another Sicilian Najdorf of the day and got a passed pawn on the queenside with some precise calculation. Ali was at sea in figuring out the best defense with his clock ticking away and Grover's Queen and Bishop dealt the knockout blow. Debashish Das and Vidit Gujrathi also moved to four points in contrasting styles. Das again came up with a fine positional display and defeated Martin Romero Martinez of Colombia while Gujrathi played out a draw with Polish Duda Jan-Krzysztof. Among other Indian boys, Asian junior champion N Srinath defeated Ali Marandi Cemil Can of Turkey, Sameer Kathmale scored over Erkin Karaolcu of Turkey while Rakesh Kulkarni drew with Vehid Mesic of Bosnia. 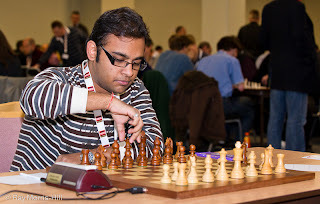 SL Narayanan ended on the losing side against Peruvian Grandmaster Jorge Cori. In the girls' championship being held simultaneously, GK Monnisha lost to Meri Arabidze of Georgia. But, Rucha Pujari brought cheers to the Indian camp defeating higher rated Indonesian Monica Sihite Chelsie. The highest rated Indian, Padmini Rout was held to a draw by Sarasadat Khademalsharieh of Iran. Rucha, Padmini and Monnisha all have an identical 3.5 points from five rounds. Ivana Furtado moved to three points after defeating Ani Krumova of Bulgaria. Anjana Krishna played out a draw while J Saranya, Shristi Shetty and Riya Sawant went down fighting. Important and Indian Results Round 5: (Indians unless stated):Alexander Ipatov (Tur, 4) drew with Yu Yangyi (Chn, 4.5); Vidit Gujrathi (4) drew with Duda Jan-Krzysztof (Pol, 4); Andrey Stukopin (Rus, 3.5) lost to S P Sethuraman (4.5); Idani Pouya (Iri, 4) drew with Urii Eliseev (Rus, 4); A R Salem Saleh (Uae, 3.5) drew with Tamas Petenyi (Svk, 3.5); Wei Yi (Chn, 3.5) drew with Mykola Bortnyk (Ukr, 3.5); Martin Romero Martinez (Col, 3) lost to Debashis Das (4); Muhammad Luthfi Ali (Ina, 3) lost to Sahaj Grover (4); S L Narayanan (2.5) lost to Jorge Cori (Per, 3.5); Ali Marandi Cemil Can (Tur, 2.5) lost to N Srinath (3.5); Sameer Kathmale (2) beat Erkin Karaokcu (Tur, 1); Vehid Mesic (Bih, 1) drew with Rakesh Kulkarni (1). Girls: Dinara Saduakassova (Kaz, 3.5) lost to Alina Kashlinskaya (Rus, 4.5); Aulia Medina Warda (Ina, 4.5) beat Aleksandra Goryachkina (Rus, 3.5); Zhai Mo (Chn, 3.5) lost to Irina Bulmaga (Rou, 4.5); Meri Arabidze (Geo, 4) beat G K Monnisha (3.5); Deysi Cori (Per, 4) beat Irina Petrova (Ukr, 3); Wang Jue (Chn, 4) beat Andrea Paula Rodriguez Rueda (col, 3); Padmini Rout (3.5) drew with Sarasadat Khademalsharieh (Iri, 3.5); Monica Sihite Chelsie (Ina, 2.5) lost to Rucha Pujari (3.5); J Saranya (2.5) lost to Sabina Ibrahimova (Aze, 3.5); Anjana Krishna (2.5) drew with Maria Gevorgyan (Arm, 2.5); Ani Krumova (bul, 2) lost to Ivana Maria Furtado (3); Shristi Shetty (1.5) lost to Anna Styazhkina (Rus, 2.5); Bibissara Assaubayeva (Kaz, 2) beat Riya Savant (1). Indian National chess champion GM Abhijeet Gupta has won the Philadelphia Chess Open and $2000 with a clear first ahead of Indian mate IM Marani Venkatesh. IM Venkatesh earned his GM title! Gupta won his final round game against IM Dean Ippolito for the title. Meanwhile, both IM Marani Venkatesh and WGM Padmini Rout, earned their GM norm and IM norms respectively. There were several other Indians in the line-up who did fairly well. GM SP Sethuraman was fourth, GM Deepan Chakkravarthy was tenth, WGM Eesha Karvade was 16th and Rout was 17th. The opposition Rout faced was strong enough for the norm for her.